Following the federal election, there is hope that there can finally be a positive and speedy resolution to the cases of U.S. Iraq War resisters. Your help is needed to make sure they are allowed to stay in Canada. Background: Canadians voted for change and expect the new government to do the right thing and let the war resisters stay. It was the strong response of Canadians that has kept most U.S. war resisters in Canada – and out of U.S. military prison – for the past ten years. U.S. Iraq War resisters have lived through a decade of unfair political interference in their cases by the previous Conservative government. Some were deported by the Harper government, and received harsh jail sentences in the U.S. for opposing the illegal and immoral invasion of Iraq. The new government should immediately heed the will of the majority of Canadians and stop any and all actions against U.S. war resisters, including halting the litigation against U.S. war resisters, as this litigation defends policies and decisions made by the previous Conservative government. During “Let Them Stay Week”, let federal Minister of Immigration John McCallum know that you support a provision to allow U.S. war resisters to stay in Canada, and that you want the current legal proceedings against them to cease. 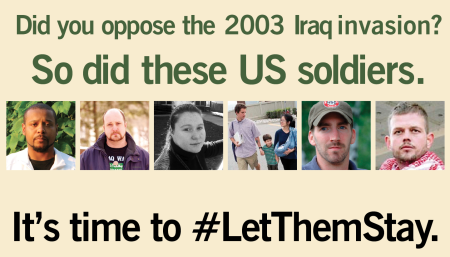 Sunday November 29 – Profile Picture Day: Change your profile picture in support of U.S. Iraq War resisters, for the duration of Let Them Stay Week. Monday November 30 – Contact the Minister Day: Watch and share this video and then phone or email Minister John McCallum to urge him to LET U.S. WAR RESISTERS STAY in Canada. Tuesday December 1 – Write a letter to the editor of your local paper. Thursday December 3 – Ten years’ worth of #TBT (Throwback Thursday) to share on social media! : Follow us on Facebook and share, post, disseminate information on Iraq war resisters in your networks. Friday December 4 – Community Outreach Day: Call your local MP’s office to express your concern; circulate the U.S. war resister petition; post a window-sign at your home, workplace, community or faith organization.